I can’t get enough of this house in Eufaula, Alabama. That facade is a true beauty! All the great historic details seem to be there, down to the wood windows and the cute porch. Don’t porches and the South work so well together? I love the sidewalk in front too – say hi to your neighbor from the comfort of your wicker rocking chair! I really love modest farmhouses like this gal — just so picturesque without having to do much. This home is very “Anne of Green Gables” to me too, which is probably a big reason why I’m so fond of it. The listing says it was built in 1872, and it seems to have a mix of Greek Revival and Folk Victorian features. The house itself has over 4,200 square feet, and is on the market for $84,000. 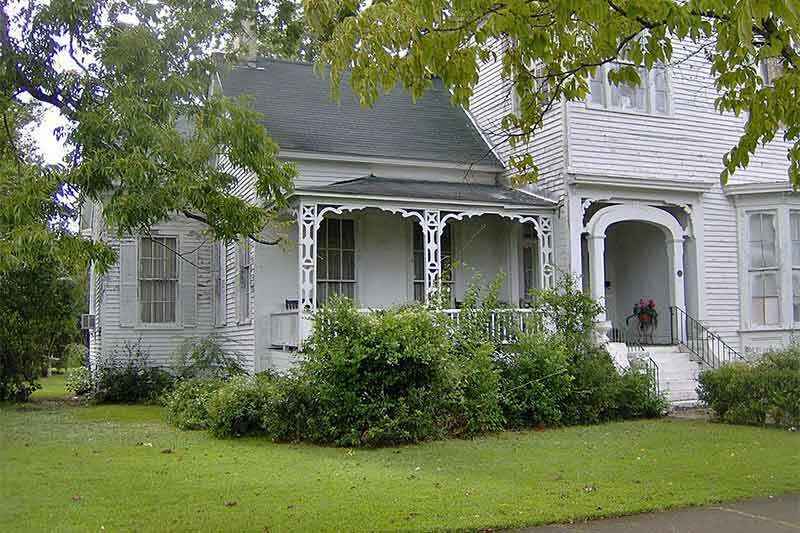 Eufaula is home to the second largest National Register historic district in Alabama, and I’d love to know if our little gem at 212 North Randolph Street is included. I couldn’t seem to get my hands on the report this time around, so if you have more information please do share! This one-story wing of the house looks like a quaint little cottage from this angle. The woodwork of those posts are truly charming! Their delicate details play so nicely off the solid wood clapboard siding. Oh, to have such a lawn to enjoy the summer outside. It all looks so serene. Unfortunately the cluttered photos of the inside don’t quite do the house justice, so try to look past that! There’s tons of potential here. Lots of natural light, a nice wood staircase, and some historic mantels to boot! I’m always amazed at people’s ability to transform spaces (like in our Before & After column), and I bet there’s someone out there who sees their dream home right here in Eufaula, Alabama. Oh this is heaven, I would love to retire here, just dreaming ,but, how much are they asking for it? I love Alabama. It is close to a house that has been in my dreams, weird huh? This house is included as a contributing member of the Randolph St. designated district.